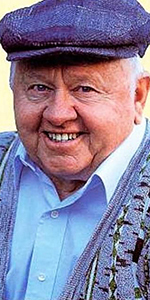 It is hard to imagine a person who held onto a Hollywood career as long as Mickey Rooney. Starting in 1926, and ending with his last feature film in 2014 — that's 88 years! Cute, a born performer with boundless enthusiasm (and we mean boundless), Rooney was a one-of-a-kind movie star. Born to vaudeville-performing parents, Joseph Yule, Jr. became part of the family act at the age of 15 months, singing a song in a tuxedo. By age three, he had become part of comedian Sid Gold's vaudeville act. In 1925, his mother Nellie took him out to Hollywood to get him a part in the Our Gang comedies, but he didn't make the cut. Auditioning at Fox, he got a part, first appearing as "Mickey McBan" in Not to Be Trusted (released in October, 1926). When cartoonist Fontaine Fox began making films of his Mickey McGuire character, Joseph Yule, Jr. got the part and changed his name to — Mickey McGuire — for more than 50 short comedies made between 1927 and 1936. As he became more in demand, Fox told the young man that he could not use the Mickey McGuire name on other projects, so Mickey changed his name to Mickey Rooney. Freelancing, Rooney worked at all the studios. His big break came by playing Clark Gable's character as a boy in Manhattan Melodrama (released in May, 1934). Rooney began appearing as a majpr supporting character, most notably as Puck in A Midsummer's Night's Dream (released in October, 1935). The Big Time wasn't far off. Metro-Goldwyn-Mayer signed him to a contract that year. Mickey Rooney will forever be associated with his title role in the Andy Hardy films, the first being A Family Affair (released in March, 1937). He would eventually star in 17 Andy Hardy films. His supporting role in Captains Couragous (which played the Chinese in July, 1937) cemented his reputation at the studio. By now, Rooney was co-starring with all the big wheels on the M-G-M lot; one of his biggest hits was Boys Town with Spencer Tracy (which played the Chinese in September, 1938). In October, Rooney was invited to make his imprints in the Forecourt. Again, regular cement artist Jean Klossner did not make the block and subsequently, Rooney's block began to deteriorate over the years. Rooney was asked to re-do his block in April, 1986. Rooney played the title role in The Adventures of Huckleberry Finn (which played the Chinese in April, 1939). Another signifigant step was the musical Babes in Arms (which premiered at the Chinese in October, 1939), where he received top billing over frequent co-star Judy Garland. They would team up again in Strike Up the Band (played the Chinese in September, 1940), and Babes on Broadway (played in January, 1941). Rooney excelled in the film of The Human Comedy (played in May, 1943) — there didn't seem to be anything Rooney couldn't do. Drafted into the U.S. Army in 1944, Rooney distinguished himself by entertaining troops in America and Europe. After his discharge, he began tussling with the M-G-M brass; After scoring big in National Velvet (released in December, 1944) and Words and Music (released in December, 1948), Rooney got out of his contract and became a freelancer. After making some comedies with Richard Quine and Blake Edwards, the three teamed up to create The Mickey Rooney Show, which ran on NBC in 1954-1955. In 1957, Rooney starred in a live broadcast of The Comedian for Playhouse 90 on CBS. He teamed up with Dean Martin and Frank Sinatra for the show Club Oasis in 1958 on NBC, and for which, Rooney entered into the orbit of The Rat Pack. In the 1960s, Rooney returned to theatrical films. He starred and directed The Private Lives of Adam and Eve (released in January, 1960), performed in Blake Edwards' Breakfast at Tiffany's (which premiered at the Chinese in October, 1961), Requiem for a Heavyweight (released in October, 1962), and It's a Mad, Mad, Mad, Mad World (released in November, 1963). By this time, Rooney had declaired bankruptcy. This did not keep The Kid down. Rooney did a ton of television appearances; everything from The Twilight Zone to The Red Skelton Hour. Rooney returned to movie screens in a big way with The Black Stallion (released in October, 1979), and its sequels, television spinoffs, etc. That year also saw him make his Broadway debut in the burlesque tribute Sugar Babies, co-starring with Ann Miller. The show was a monster hit, with Rooney and Miller touring in it for five years. In 1983, Rooney was given a lifetime achievement Oscar by the Academy of Motion Picture Arts and Sciences. Rooney continued acting right to the the last. He enjoyed success with Night at the Museum (released in December, 2006), and The Muppets (released in November, 2011). His final film was Night at the Museum 3 (released in December, 2014). Rooney died of natural causes in 2014. Grauman's Chinese Theatre, Hollywood, California. 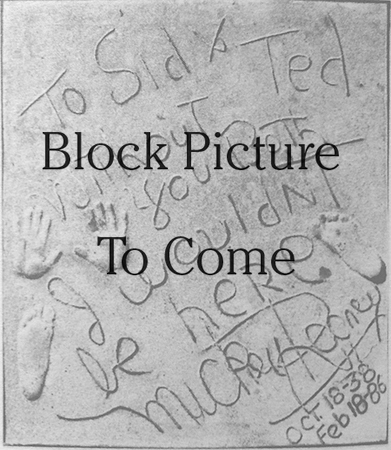 Mickey Rooney Forecourt ceremony, Tuesday, February 18, 1986. 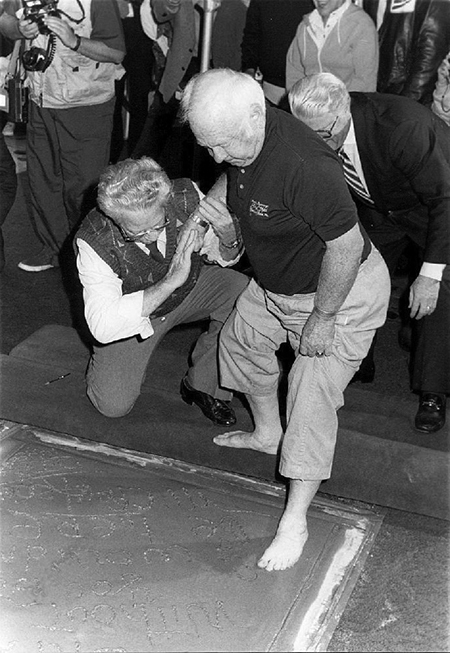 Cement artist John Tartaglia assists Mickey Rooney make his foot impression.